I Need to create a post function "Create issues and subtasks". We want to create in each "ORM" Project the same issue. Is there any possability to do this in one postfunction? Do you want to use the suffix of the project current issue belongs to, or it's always ORM suffix? it is always ORM. The reason for that is that we now have , lets say , 4 Projects with ORM , but in the future 7 and I do not want to edit the post function again. Thats way we are using the Suffix. 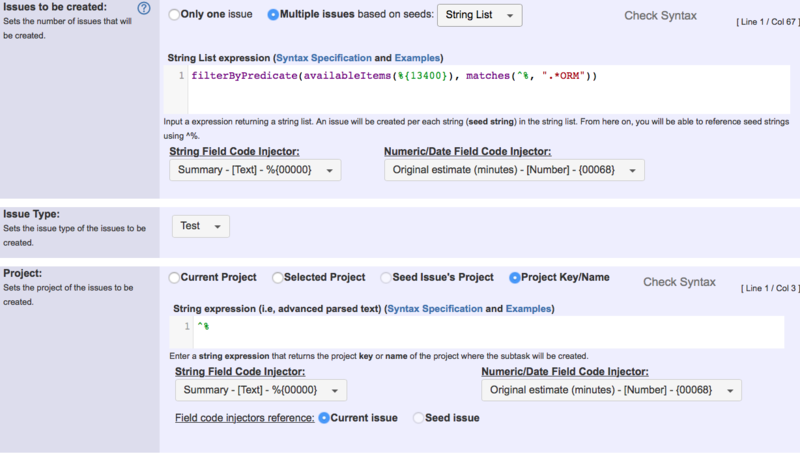 replacing nnnnn with field code of a Project Picker (single project) custom field. If you don't have any, you should create one for this purpose. You don't need to add it to any screen of your workflows. thanks this is partically working for me. Just one Thing: The function matches is now looking in the Project key with .ORM. Is it possible to look in the Project Name with .ORM instead of the key ? Sorry, currently it's not possible. We can extend the parser to support it. Do you really need it? Yes this would be great if this is possible. Would this be in a new Version ? Thank you very much. Looking foward for the new Version.